The interim Geneva agreement between the P5+1 nations and Iran that eases some international sanctions on the Islamic Republic in return for suspending its uranium enrichment program, has been hailed in many quarters as a major diplomatic triumph, but not in Israel and not in the Sunni Muslim states of Saudi Arabia and the Gulf. Those in favor of the agreement stress that they have not been deceived by Iran. "Verification is the key," said Secretary of State John Kerry, insisting that the United States had "no illusions" and was aware of the danger of easing up on Iran. It had entered into the deal "with eyes absolutely wide open." There is also the stick behind the carrot that any reneging by Iran might result in possible military action, although the dithering U.S. policy on Syria hardly strengthens that threat. With the American public's appetite for another war at an apparent all-time low, the feeling is that even if the Geneva deal falls apart, Israel might be left to act without direct U.S. participation against Iranian nuclear facilities. Israeli Prime Minister Benjamin Netanyahu on Sunday reiterated his long-held opposition to the deal. "What was achieved last night in Geneva is not a historic agreement; it is a historic mistake. Today the world has become a much more dangerous place because the most dangerous regime in the world has taken a significant step toward attaining the most dangerous weapon in the world." A number of respected voices from within Israel, including former Chief of Defense Intelligence Amos Yadlin, believe that the deal should be given a chance, emphasizing that it is only the first step on a potentially long road of negotiations. "If this was a final agreement, it would indeed be a very bad deal, but this is not the case," Yadlin said. "I hope that the prime minister is now formulating a strategy to see what happens in the next six months." But what is it in the P5+1 deal with Iran that the Israelis, the Saudis, and other Sunni states in the region find hard to swallow? Sanctions relief – The P5+1 took the view that limited sanctions relief was more likely to encourage Iran to halt its nuclear development program if it felt that real engagement with the international community was on the table. Israel and the Saudis insisted that it was precisely because of the sanctions that Iran was ready to cut a deal, as its economy was in meltdown. They argued that rather than easing up on sanctions and giving Iran the breathing space it craved, the international community should turn the screw and impose additional punitive sanctions in order to fatally cripple Iran's ability to continue its nuclear program. The six-month interim Geneva agreement appears to have thrown Iran a lifeline without requiring anything in return. No dismantling of infrastructure – Had the Geneva agreement included some dismantling of Iran's nuclear infrastructure, it is possible that Israel would have supported the deal. Iran, however, is not required to take apart any of its equipment or facilities put in place in recent years. Iran's ability to restart its nuclear program remains intact. Professor Zeev Maghen, an expert on Iranian affairs and Senior Fellow at Israel's Shalem Institute, is among many highly skeptical of the deal. "This deal goes one worse [than the Syrian deal] and does not even involve the dismantling of any of the material," Magen told the Investigative Project on Terrorism. Referring to the Iranian centrifuges that could enrich uranium to 20 percent nuclear weapons grade material, he added, "We're saying they can spin their washing machine on a slow cycle instead of a fast cycle, and when they feel like it they'll just switch it to the fast cycle once again." Ineffective inspections – The spectre of a similar, failed attempt to stop North Korea from making nuclear weapons looms large to the deal's critics in Israel and elsewhere. When the U.S. and others felt North Korea wanted genuine negotiations, their desire for reaching a deal appeared to blind them to the embarrassing reality that the North Koreans were pulling a fast one. North Korea continued to move toward the nuclear capability it eventually achieved while deceiving the West of its desire to reach a deal in exchange for the easing of international sanctions. Critics of the Iran talks fear that the P5+1 have fallen for the same trick. Another source of concern is that U.S. Under Secretary of State Wendy Sherman, a key part of the U.S. negotiating team with North Korea a decade ago, has again been entrusted with negotiating for America. When the International Atomic Energy Agency agreed on a deal with Iran to inspect its facilities in 2012 – facilities which have subsequently progressed Iran's nuclear program – Israel's then-Finance Minister and current Mister of Intelligence Yuval Steinitz warned that Iran had "been playing hide and seek with the West" for years. "There is always a new surprise in terms of the Iranian nuclear program," Zeev Maghen observed. "I guess the surprise would be in this case if there are no surprises. It is possible that there are other sites, and some of those [on the inspection list] are decoys." No let up in Iran's state-sponsored terrorism – While Iran is obliged to halt its nuclear development program during the six months of the Geneva agreement, nothing within the deal links any future comprehensive agreement to cessation of Iran's sponsorship of international terror organizations, or its repeated calls to destroy Israel. Iran will continue its patronage of the Lebanese terror movement Hizballah, is reportedly re-establishing its support for Hamas in Gaza, as well as remaining the key ally – both in providing weapons and military personnel – to the genocidal Assad regime in Syria. Saudis-Sunnis feel betrayed – "It's clear from everything you hear and read that the Arab world is not excited about what is going on in Iran, so there is a convergence of interests on this specific issue," Israel's Foreign Ministry spokesman Paul Hirschson told the IPT. Until now, it had been hard to imagine Israel and Saudi Arabia publicly finding common ground, but they have on the Iranian issue. It appears that contacts between the two countries in advance of a perceived sell-out by the U.S. have been developing throughout this year and have accelerated in recent weeks. The Sunni states feel betrayed by the Geneva agreement. "I think what was not mentioned in the agreement is the most important," former Kuwaiti minister Sa'ad bin Tefla al-Ajmi told Al Arabiya TV, "and that is the agreement in itself is a blessing to the aggressive policy of Iran in the region and its interventions in the region, whether in Iraq or in Syria or in Lebanon or in Bahrain and in Yemen." "In order to understand what the Gulf States are doing on this issue," David Weinberg, a senior fellow at the Foundation for Defense of Democracies told the IPT, "you have to look beyond their formal statements. When you analyse what is being said there is great concern about this amongst at least four of the GCC [Gulf Cooperation Council] states – Saudi Arabia, Kuwait, Bahrain, and the UAE. They all see themselves as deeply threatened, undermined, and encircled by Iran." Paul Alster appears to want to turn the world upside down. After all, Christians are fleeing the genocidal Sunni Takfiris being sponsored by Saudi Arabia and Qatar in Syria. Also, do I really have to state that nearly all individuals involved in September 11 came from Saudi Arabia? Likewise, Hezbollah in Lebanon is in partnership in many areas with the main Christian party in this nation under Michel Aoun. Also, in Syria churches have been rebuilt once the Syrian army re-took control - or when Hezbollah helped to clear the area of al-Qaeda affiliates sponsored by Qatar and Saudi Arabia. Obviously, from September 11 to Madrid to Bali it is radical Sunni Islamic terrorist forces behind these barbaric acts. Similarly, it is well known that Gulf petrodollars are fanning radicalism in many parts of the world and the al-Shabaab in Somalia and Boko Haram in Nigeria belong to the same radical Sunni school. In Afghanistan it is clear that Iran offered the hand of support to America because the Taliban and al-Qaeda hate the Shia - and we know America and Iran worked together in Bosnia against the Bosnian Serbs. In other words, just like the Iran-Contra affair highlights, not all is what it appears between America and Iran and the same applies to the situation in Iraq. Indeed, international Sunni jihadists went to Iraq to kill American troops while the Shia fought to defend themselves and clearly the US enabled the Shia to take over the reigns of power in Iraq. The Investigative Project on Terrorism is highly valued but some individuals with a pro-Israeli agenda want to distract people from reality and this is dangerous. In America and the UK it is clear that nearly all internal terrorism from Islamists is overwhelmingly from the radical Sunni strand. The nuclear issue is complex but I would more worry about Pakistan given the reality of al-Qaeda affiliates in this nation alongside the Taliban. Also, it is clear that Pakistan is utilising terrorism in Afghanistan and Kashmir for geopolitical gains and internally Pakistan is in crisis. Meanwhile, in modern day Saudi Arabia not one single Christian church is allowed and in the Caucasus region many ratlines link the Gulf region to Sunni Islamic terrorism. In Central Asia and the Caucasus region it isn't Iran which is spreading radical Islam - on the contrary, it is powerful Gulf states and Turkey which belong to the Sunni world. Indeed, Iran is a friend of Christian Armenia which suffers greatly because of the economic blockade by Turkey. The nuclear issue is complex therefore it is best to leave out false propaganda by glossing over Saudi Arabia and its role in international terrorism and spreading radical Salafism. Indeed, the world will be a better place once Gulf petrodollars are challenged and the same applies to the feudal monarchs which spread radical Sunni Islam to many nations. If Paul Alster would like to deny that MI6, BND, CIA - and others - are mainly concerned by radical Sunni Islamic terrorism then please let him do so - then people will understand that this individual is only concerned about Israel and not international terrorism nor the rights of Christians. there is a world of difference between "Iran" as a nation state, and "The Islamic Republic of Iran." "The Islamic Republic of Iran" is not a nation state in the normal sense of that term. The difference is clear from the Preamble of the Constitution of the Islamic Republic of Iran, one part of which reads as follows: "An Ideological Army In the formation and equipping of the country's defense forces, due attention must be paid to faith and ideology as the basic criteria. Accordingly, the army of the Islamic Republic of Iran and the Islamic Revolutionary Guards Corps are to be organized in conformity with this goal, and they will be responsible not only for guarding and preserving the frontiers of the country but also for fulfilling the ideological mission of jihad in God's way; that is, extending the sovereignty of God's law throughout the world (this is in accordance with the Koranic verse "Prepare against them whatever force you are able to muster, and strings of horses, striking fear into the enemy of God and your enemy, and others besides them." [8.60])"
To ask the Ayatollahs to give up their ambitions to acquire nuclear weapons is to ask them to violate their Constitution and their Koran which requires them to acquire "whatever force you are able to muster", -- and that includes nuclear weapons! -- in order to extend Sharia law throughout the world. They will not violate their constitution and their religion. It won't happen. 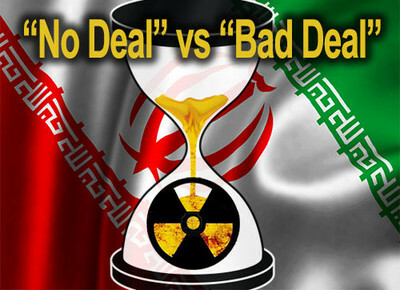 Negotiations and this "deal" are worse than fruitless because they give the ayatollahs time to acquire their nuclear weapons. And then it will be too late. Kerry, of course, understands none of this. You can be sure that he has never troubled himself to read the Constitution of the Islamic Republic of Iran.